Several Sunni insurgent factions fighting in Iraq have recently released official communiqués addressing brewing conflicts over the jihad media war--including divisions that exist within the mujahideen community itself. On August 29, the Mujahideen Army issued a statement accusing their "dear brothers" from the Al-Furqan Foundation--the official media wing of Al-Qaida's "Islamic State of Iraq"--of distributing a video of a military operation that had already been claimed months earlier by the Mujahideen Army. In due course, the ISI's Al-Furqan Foundation issued a response acknowledging, "the operation had indeed been executed by one of the central brigades of the Mujahideen Army... However, following the establishment of the ISI, this particular brigade pledged its allegiance to Abu Omar Al-Baghdadi and, therefore, their media archives became the rightful property of the Al-Furqan Media Foundation." The ISI has also sparked controversy with the recent release of an audio recording by its leader Abu Omar al-Baghdadi, including accusations that several major Sunni insurgent organizations are now working in conjunction with U.S. forces. One of the groups singled out by al-Baghdadi--the Iraqi Islamic Resistance Front (JAAMI)--has issued its own letter firmly denying these allegations and demanding that "the gossiping cease from all those who posted harsh words on the Al-Hesbah web forum." Separately, Asaeb al-Iraq al-Jihadiya ("the Iraqi Jihad Union") has announced the expulsion of several prominent activists within its organization for unauthorized contacts with unspecified "outsiders." Finally, the ISI's Al-Furqan Foundation has released a statement condemning a series of recent electronic attacks by "crusaders" on notorious jihad web forums--including the Al-Hesbah network. - [CTBLOG]: "Operation Niche: The Conviction of Mohammed Atif Siddique"
- Report: "State of the Sunni Insurgency in Iraq: August 2007"
Al Qaeda leaders Osama bin Laden and Ayman Al Zawahiri have declared war against President General Pervez Musharraf. Osama bin Laden has said that he will retaliate against the “infidel” Musharraf “and those helping him” for the killing of the Lal Masjid cleric, Rashid Ghazi. Al Zawahiri has directly challenged the Pakistan army by saying that retaliation against it had been ordained by Allah. The announcement, amounting to a declaration of war, has come at a time when the Supreme Court of Pakistan is hearing six cases against President Musharraf’s dual office and complaining that politicians are once again trying to dump their quarrels on the Supreme Court. The government, though isolated because of its internal fissures and its inability to negotiate politically with the opposition, insists it will not declare emergency or impose martial law in the country. But let’s face it. The Al Qaeda threat could actually provide grounds for suspending the normal application of law in the country. The outside world whose support is so crucial to the survival of Pakistan’s economy has so far taken the view that President Musharraf should usher Pakistan back to democracy as soon as possible. Indeed, the opinion inside the European Union has been quite clear and in favour of the political parties struggling to force President Musharraf to end military interference in the running of the country. The Commonwealth had suspended Pakistan’s membership in 1999 under the Harare Declaration that Pakistan had helped sign, and restored it only conditionally after the 2002 elections. Its latest position is that he should not continue in his dual office. But all these positions held abroad may undergo “internal change” after the Al Qaeda challenge, which might be to the disadvantage of the opposition parties in Pakistan. Al Qaeda has always been a delicate subject to discuss in Pakistan because of the political and social divisions it creates. Focused on the so-called “Islam versus the West” cause, most Pakistanis regard Osama bin Laden as a hero and do not even believe that he attacked the United States on September 11, 2001. At the grassroots level, there is so much antipathy for US President George W Bush that any comparison between “Osama and Bush” ends up showing bin Laden as the most popular man in Pakistan. Unfortunately, the presence of Al Qaeda in the Tribal Areas of Pakistan adds another dangerous dimension to the discussion. Al Qaeda holds sway over territories that sent thousands of its young men to Afghanistan to fight the “American invasion” of 2001 on the side of the Taliban. Foreign elements belonging to Al Qaeda are present in these areas, although this fact is vehemently denied by the political parties opposed to President Musharraf’s “war against terrorism”. But the fact is that Al Qaeda has targeted President Musharraf ever since he arrested some of its key operatives and handed them over to the Americans in 2003. Its declaration of war at this stage simply announces its dominance over Pakistani territory and seeks to exploit the political strife inside Pakistan. The power of Al Qaeda is the power of intimidation which it created gradually in the Tribal Areas by killing off hundreds of local maliks who controlled the political system in operation there. This power is akin to the extra-constitutional power exercised by all religious groups in the name of Islam, but Al Qaeda has the additional power of the purse that smaller groups do not have. Many warriors in the Tribal and Semi Tribal Areas abutting on Afghanistan are on the payroll of Al Qaeda while mouthing Islamic slogans. Sadly, many “supporters” of Al Qaeda in the rest of Pakistan have been converted by intimidation under what is called the “Stockholm Syndrome”. In some ways, the discussion of democracy at the Supreme Court looks out of place when all the political institutions may be under threat from terrorism which is unfortunately seen as an “Islamic” force by the common man. For instance, the lower judiciary in Pakistan has always lived in fear of religious groups seeking to bend the magistracy to their stance on blasphemy and apostatisation. Therefore the prospect is that all offices of the state could now come under pressure from local religious groups acting as informal representatives of Al Qaeda. Indeed, if the reversals experienced by the Pakistan army in its war with Al Qaeda continue, and the army fails to retrieve the soldiers it keeps losing to it through “un-resisted” abductions, the dominion may actually pass from Islamabad. God forbid that the Supreme Court should actually have to decide as to who is the enemy of democracy, Musharraf or Osama? Pakistan is poised to return to democracy with the help of the judiciary. The people are supportive of this transition, but they are also supportive of a global terrorist organisation that now has the potential of controlling territories. This is the terrible dilemma which we as Pakistanis face. CHITRAL, 09 Sep 07: The Kafir Kalash tribe of the Hindu kush surviving in the three tiny valleys of Chitral District are a real remnant of the Pagan societies of yonder days. Everything about them including their way of living and dying are categorically different. The death of the wife of Kalash elder Bahram sha, a member of the Chitral District council witnessed Kalash children the traditional way of the Kalash observing (celebrating) occasions of death. 8 Bullocks, 22 sheep, 30 large canisters of Cheese besides maunds of flour, rice and other edibles were consumed during the death celebration, which included dancing in chorus and chanting the virtues of the deceased besides feasting on the occasion. Kalash from all the three valleys had gathered for the rites. AND THIS WAS 6 YEARS AGO, MANY INTEL SERVICES USE MANY POSSE's NOW, HUNTING INTERNET JAHIDISTS. Tens of thousands of computers containing now-dormant Leaves worms await instructions from their master. Should they ever again awaken, a posse will be waiting. After 23 years as a CIA analyst, having briefed the president and his team on every conceivable threat to national security, Bob Gerber was scared. More scared than he'd been in a long time. Holed up in his cramped, 11th floor office on a stark, colorless hallway at FBI headquarters in Washington, Gerber's stomach turned as he took his first look at a new enemy. Gerber was a hunter, one of the government's best. These days, he was hunting worms, malicious computer programs let loose into the wild of the Internet by some of computerdom's most brilliant hackers. Two months earlier Gerber, 56, had left his job at the CIA, where he helped write the president's daily intelligence briefing, to head the analysis and warning division at the FBI's National Infrastructure Protection Center. There, he and his crew of more than 60 tracked worms, viruses and other computer evils, as well as the hackers who create them. Both threatened daily to shut down the engines of modern life - electrical power grids, the banking system, water treatment facilities, the World Wide Web. Worms were the most vicious new beasts to stalk the Internet. But Gerber had never seen a worm quite like the one he confronted that sweltering Wednesday morning in June. It was named Leaves after "w32.leave. worm," the poisonous file it implanted in unsuspecting computers. Like all worms, Leaves bored through cyberspace, probing Internet connections for holes in personal computers or Web servers. It slithered inside the machines and spewed venomous strings of data that threw its victims into electronic shock. Leaves was hardly the first worm to infest the Internet. In fact, the pests became so common in 2001, that security cognoscenti dubbed it the "Year of the Worm." Worms wrought all sorts of damage. They forced computers to delete critical files or erase entire programs. They also allowed hackers to steal personal information from computers' memories. Once they infested their victims, worms made clones, then used their hosts as launching pads for more worms, whose numbers grew exponentially. In 2000, Gerber and his team began battling a new species of even more virulent super worms. Rather than devour computers' innards, these worms hijacked their victims' controls, rendering them powerless zombies. With a gang of zombies at his command, the creator of a superworm could mob a Web site or computer system, flooding it with bogus electronic transmissions until it drowned in the data torrent. In the spring of 2000, Gerber's colleagues took on a 15-year-old hacker who called himself Mafiaboy. The teenager turned his zombies loose on World Wide Web giants Amazon.com, eBay and Yahoo!, launching what is called a distributed denial of service attack that shut down business at the sites for five hours. It cost shareholders and the companies billions and shocked the Web world. But compared with the Leaves worm, Mafiaboy's creation was a larva. Gerber's best analysts had worked late into the night trying to make sense of a sample of Leaves captured by worm watchers at the SANS Institute, a computer research center in Bethesda, Md. They let Leaves infect a computer, and then they watched how it behaved. What Gerber saw fascinated and appalled him. Leaves was a zombie maker on steroids. It searched out computers already wounded by another Internet scourge called a Trojan, which installs back doors in the machines. Leaves used a Trojan called SubSeven as its entrance. Once transformed, the zombies awaited orders. To communicate with them, Leaves' creator ordered his zombies to rendezvous online through Internet Relay Chat channels. He also told them to visit certain Web sites and download encrypted information to receive instructions on what to do next. No one knew who was controlling the zombies, from where or why. Taliban commander planning suicide attack in Lahore? LAHORE: Police officials have received information about possible suicide bomb attacks by the religious fundamentalists and have issued directions to deal with the threat. Police sources said that Taliban commander Qari Hussain Ahmad is reported to be present in Lahore. The areas of Badamibagh, Shafiqabad, Misri Shah, Shahdra Town, Shadbagh, Ravi Road and Lorry Adda had been identified as possible hideouts for miscreants. The security forces at Allama Iqbal International Airport had also been put on high alert as intelligence reports have reported a suicide bomb threat at the airport. The airport officials said that all flights would remain on schedule. Sources said that police and other intelligence agencies had been on the lookout for any terrorist activity for the last few weeks. Based on intelligence reports, special directions had been issued and specially trained officials had been directed to gather information data about any terrorist activity. Senior Police officials have issued directions to Town Police Officer (TPO) Ravi Road in this regard. Sources said that police and intelligence agencies had deployed intelligence and operational personnel in sensitive areas. These officials are ready for conducting any type of operation against the militants. Sources said that in order to maintain the law and order situation surety bonds had been signed from different religious leaders in Lahore and other cities. The Allama Iqbal Town TPO had taken a surety bond of 100,000 rupees from religious activist Ali Sher Haidery and put the activist under constant surveillance. Is Al Qaeda Iraq a Threat to Sweden? The leader of al Qaeda in Iraq recently offered a bounty encouraging the assassination of a Swedish cartoonist and his editor for having published drawings deemed insulting to the religion of Islam. Omar al Baghdadi, in an audio statement said Lars Vilks, who "dared insult the Prophet", should be killed for a reward of $100,000 and, if "slaughtered like a lamb", the killer will receive another $50,000. In addition, he offered a Jihadi financial reward of $50,000 for the murder of Ulf Johansson, the editor of Nerikes Allehanda, the Swedish paper that printed Vilks' cartoon on August 19. In the context of Global Jihadism, this second cartoon drama -- after last year's Danish cartoon crisis - displays a dimension very relevant to the ongoing War on Terror. Indeed, the identity of the threat issuer is important, because it is al Qaeda in Iraq. This development should send a significant message into the American and international debates about that conflict, especially as a significant faction within the US Congress, some of whom claim that Iraq is fighting only a civil war, is pressing for a rapid withdrawal of US troops. What the "Jihad bounty" tells us loud and clear is this: al Qaeda's operation in Iraq is not, nor will it be, "only" about an American, Western or international presence. As the AQI press release shows, there is clear evidence that those who are beheading, killing, maiming, kidnapping and blowing up people and things in the Sunni Triangle and in the rest of Iraq have an agenda of international violence. Iraq is merely their launching pad. Regardless of whether one admires the common sense or deplores the bad taste of the cartoons published this summer in the Swedish Nerikes Allehanda, or last year in the Danish Jyllands-Posten, why would al Qaeda Iraq -- and not international, European, or even Scandinavian al Qaeda -- initiate the release? Aren't the other branches ideologically "insulted" too? The answer is simple: The Iraqi branch of al Qaeda is using a cartoon published in Sweden, "deep inside infidel land", to tell the world, Muslims and non-Muslims alike, that the emirate they want to build in Iraq -- with blood and death -- will have very long arms, capable of reaching Europe, America and beyond. Indeed, the logic of the release is not about "defending Iraq from occupiers" as claim many critics, but it's about punishing anyone who insults their religion anywhere around the world, with money -- and maybe suicide bombers -- coming from Iraq. The Swedish cartoon, perhaps deemed offensive to devout Muslims, can be responded to in many forums and possibly in front of courts, depending on Swedish law. But al Baghdadi is telling us clearly that he and his ilk will determine whether an offense has taken place and, if so, how they will execute the offending artist as well as others involved and, as he said in his declaration, punish the entire country and its financial interests around the globe too. Thus, Al Qaeda Iraq is an international Jihadi operation which will -- and now has demonstrated clearly that it would -- strike thousands of miles away from Iraq to satisfy its ideological vision of the world. For if tomorrow another "insult" is seen in London, Paris, New York, or Moscow, the terrorists of al Qaeda Iraq will fund and direct violence against the offenders, their cities, their countries, and their financial interests throughout the world. Therefore, because of a cartoon, a Van Gogh-like tragedy could occur in Stockholm, and companies such as Ericsson, Scania, Volvo, Ikea, and Electrolux, may be targeted -- either by al Qaeda or by homegrown Jihadists. Other artists around the world and millions of workers in companies originating in liberal democracies will be at risk because of the imagination (albeit sometimes very insensitive) of one man's free mind. This sort of freedom is what the Enlightenment has produced: free choice. And this is what al Qaeda Iraq is telling the world it can no longer have; there is no more free choice, and we will punish you if you exercise it, at our own discretion. "only hope that Muslims in Europe and in the Western world choose to distance themselves from this and support the idea of freedom of expression." His Prime Minister Fredrik Reinfeldt told the 22 Sweden-based ambassadors from Muslim countries that he regrets the hurt it may have caused, but said that according to Swedish law it is not up to politicians to punish the free press. Eventually some mainstream Muslims will -- understandably -- vehemently criticize the offense in the substance of the sketch, but will adhere to the norms of international law, particularly the freedom of press and expression. The issue, now becoming chronic, will generate debates in the Muslim world and internationally. But aside from this cultural clash, al Qaeda Iraq has just reminded us that indeed, it wants and will use a launching pad to wage terror attacks worldwide. Just remember that Sweden, unlike Denmark -- and certainly in opposition to the United States -- has steadfastly opposed the War in Iraq, doesn't have troops in the region and, ironically, funds many associations inside its own borders that promote Jihadism as an ideology. Swedish foreign policy already is the best Islamists could lobby for in the West. And yet, this Scandinavian economy is now menaced from as far away as Anbar province. Just imagine if the Coalition surrenders the area -- not to an Iraqi democratic Government -- but to a full fledged Taliban-like regime. ALGIERS — Al-Qaida's branch in North Africa claimed responsibility Friday for a suicide bombing in Algeria that wounded two French people and one Italian, hours after it had threatened French targets in the region. In an "audio statement" posted on the Internet and received by Al-Arabiya television's office in Algiers, al-Qaida in the Islamic Maghreb said one of its militants carried out the attack with a car laden with "more than 250 kilos of explosives." Friday's bombing in Lakhdaria, about 75 kilometers southeast of Algiers, "killed three foreigners" and wounded others, Al-Arabiya quoted the group as claiming. But the Algerian interior ministry said in a statement that no-one was killed while nine people suffered injuries which were not life-threatening. Al-Arabiya aired part of the audio recording, in which the "press spokesman" of the group said "the heroic martyrdom-seeker Othman Abu Jaafar" rammed a Mazda car into a convoy in which "French crusaders working on building the biggest dam" in the area were travelling. The news channel showed a picture of a militant carrying a machinegun, with the inscription "martyrdom-seeker Othman Abu Jaafar" written on it, which accompanied the statement. The targeted Frenchmen were escorted by Algerian army and police vehicles at the time, the recording said. "The explosion resulted in the destruction of the Toyota vehicle which carried the Frenchmen and the death of those who were in it, thanks be to God," the spokesman added. The bombing, which wounded six Algerians in addition to the two French engineers and the Italian, came just hours after al-Qaida called for an offensive against French and Spanish targets in the Maghreb. "We take these new threats very seriously," foreign ministry spokesman Frederic Desagneaux said in Paris. "We have instructed the diplomatic stations concerned to reinforce security." France "firmly condemns Friday's terrorist attack", Desagneaux said. Two French nationals who worked for the airport management company Aeroports de Paris were sent back from Algeria earlier this week after France received an Algerian intelligence tip-off that they were to be kidnapped by extremists. Algerian agents had specific information about "threats of an abduction" targeting the two airport employees from a "terrorist group linked to al-Qaida", said a source. Scores have died in bomb attacks claimed by al-Qaida across Algeria this year. On Thursday, al-Qaida No. 2 Ayman al-Zawahiri issued a video message calling for the "cleansing" of French and Spaniards from North Africa as a first step in restoring the Iberian peninsula to the Islamic world. European diplomatic sources and witnesses said the Italian and the two French people, who worked for construction firm Razel, were in a car being escorted by police when the explosive-laden vehicle slammed into their convoy. It was not immediately known if the suicide bomber died. The Italian was the most seriously injured among the casualties, according to diplomats in Algiers. A spokesman for Razel, a subsidiary of German multi-service group Bilfinger Berger based outside Paris, said the three foreigners and an injured Algerian driver had been taken to hospital in Algiers and were "out of danger." Al-Qaida has stepped up operations in North Africa through its Algerian offshoot, the Salafist Group for Preaching and Combat (GSPC), which has been renamed al-Qaida in the Maghreb. But there are so many bureaucratic hoops to jump through to get those tiny UAVs in the air that many captains have stopped bothering to try. Air clearance is the hoops that comes up most. Although the drones are small, they can get up pretty high -- 1000 feet, or more. Which means there's a concern about the UAVs getting tangled up with helicopters. Setting aside space for the drones can take 24 to 48 hours -- and insurgents don't usually stay in one place that long. A few weeks ago in Anbar, I spoke to local Marine commander who had basically given up on using his Dragon Eye, for this reason. The same thing happened in Tarmiyah, north of Baghdad, where Captain Pat Roddy told me, "the Raven? Never fly it." Which is particularly frustrating. Because Roddy regularly gets airspace for himself, to fire mortars. But his higher-ups won't let him launch his drone during that time, because the computer program that tracks airspace says its a no-aircraft zone. Roddy has been told that he can make an emergency switch from mortar to Raven airspace -- and it'll only take an hour to make the switch in the computer. But he can only do so if his troops are in a firefight. And firefights in Iraq almost never take more than a few minutes. An hour later, the Raven is all-but-useless. Prompted by the following action alert from GDG contributor Kenneth Timmerman, I discovered that Iranian president Ahmadinejad still plans to visit 'ground zero', despite the NYPD's refusal to allow it for "security reasons". The Foundation for Democracy in Iran, in coordination with Citizens United and other groups, is calling on all Americans, regardless of their origin or political beliefs, to come to New York on Monday to defend Ground Zero from desecration by the terrorist president of the Islamic Republic of Iran, Mahmoud Ahmadinejad. We will be chartering buses from the Washington, DC area. Please watch our website, www.iran.org, for more details and for rendezvous points. For more information about this, please visit Michelle Malkin's blog. Updated/ bumped by Howie. McCain says Ahmadinejad should be physically restrained from getting to the WTC site. McCain is joking. But seriously, Ahmadinejad should be blocked. Allahpundit has the video. Read More "Ahmadinejad To Visit WTC Site Despite Official Refusal - UPDATED"
But that was merely Act II. Act III began this morning, when the Iranians announced their intention to visit the WTC site regardless of no police protection. Ahmadinejad won’t be able to lay a wreath at the memorial, but he will be able to go downtown to the WTC site for a photo op. So that’s what we are trying to prevent. Come out on Convoy with us for the day, taken at 4 times normal speed Iraq. Al-Zawahiri called on the Muslims in the Maghreb to bring Andalusia back into the fold of Islam, and stated that this could only be done by "purging the Islamic Maghreb of the French and the Spanish who have returned there." Watch you can see them twirl through the contrast band to spot targets, WHILE FLYING THE JET: and you see the RPG the guy picked up just before they FIRE. A USAF F-18 takes out IED and group of insurgents in Ramadi, Iraq. i know that you are interested in these events and i have just found an interesting post in one of the forums about the strategy of al qaeda in recent weeks in iraq. From alhambra in Infovlad forum. besides that there are reports that the islamic state is making progress south of baghdad as well as in diyala and in fallujah where they have gained control of more areas. also news are coming in of the killing of the chairman of the awakening council in mosul, as well as some tribes in the anbar province have turned away from the coalition with american forces. edit: sorry got that wrong, i don't know if the council chief in mosul has been killed, but his entire house has been blown up. How could rule lure and kill this man? In fact, I was feeling great that the rule was in the process of deceiving the American forces and their allies from Sunni tribes in Anbar! 1-emerge leader of the Islamic State of Iraq audio tape provided by the threat Waida and threatening the American forces and their allies that his full strength and they did not Enhazumoua but war and Machination. 2-Sekovoa martyrdom operations to stop the creep of Anbar. 3-Sekoumoua Setaratham extension to other cities and other Kalmosal to distract the American forces as they were doing in the past. As you can see Al Qaeda did not do any of that on the contrary. Where evacuated Anbar gunmen in full so that Ramadi has no process months ago! Dignity Plan, which usually Matincherha base every two weeks and put the proceeds of the operations carried out by the latest statistic is the worst statistical passed to the armed operations in Iraq! After that was published in June last more than a thousand in the two weeks unpublished only 200th process in August! ! What is the reason for the publication of such statistical modest? ! ! In particular, the American forces waged war Trosa relentless! This contravenes policy Qaeda briefing. With all these facts realized that there was a game played by Al Qaeda and the trick is, and I have intend to write about this matter before the incident but retreated in fear of eventually create confusion particularly it is just conjecture is not evidence, but here it is speculation to become a reality. The goal is that Al Qaeda and terrorism in Iraq reached fully convinced that the American forces on the verge of departure, where the war has overwhelmed many They must bow to popular demands to withdraw. The withdrawal of the American forces from Iraq would mean that control of the gunmen is therefore a danger that calms rights beta does not know how constructive foundations and therefore wanted to rule this trick to recognize the loyalty of Iraqi tribes and discovered sincerity in armed protection and support sponsors prior to the withdrawal of American forces from Iraq. Because loyalty sometimes be due to fear of oppression and this showed their vulnerability to show the facts and identify everyone who was sincere in loyalty who was stalking them secretly. They made the month of Ramadan and the beginning of the liquidation of the account with their enemies! As to why they made the month of Ramadan is the beginning. That is what this month from high impact on the morale of the armed rise and the morale of the American forces dropped. The gunmen already succeeded in implementing their plan and malicious Astadwa leader Anbar awakening on the first day of Ramadan, which means that things will be terrible in the coming days. Misfortune is not in the killing of the leader of the Council, but will come with Beyond As we talked earlier that assassination is one goal of the objectives of the plan, but there is more. It completely disrupt the situation in Anbar and the subsequent assassinations of the front of this council and oral suicide operations inside Anbar, especially in centers of the army and the police, members of the awakening of Anbar become exposed and their faces known showed their understanding during the withdrawal of gunmen no longer their secret to anyone here, the problem! It is therefore not surprising when they are forced out of Anbar as soon as possible Etjerawa not understand it only after certain that the gunmen had been completed, even though they complain even a mere suspicion that the gunmen return of Anbar what they do and what they do not have confidence that the leader of the American forces. For this I expect that the American forces rectify the situation as soon as possible and develop solutions for that. I do not think that the confrontation with the gunmen by clan will be useful factors in the interest of all armed, they often optimistic about Ramadan and the morale is very high and often complains of increasing American forces operations at this time. Let us wait Falayam pregnant with surprises. في الحقيقة كان يساورني شعور كبير أن القاعدة كانت تقوم بعملية خداع للقوات الأمريكية وحلفائها من العشائر السنية في الأنبار ! 1- سيخرج زعيم دولة العراق الإسلامية بشريط صوتي يملؤه تهديدا ووعيدا ويتوعد فيه القوات الأمريكية وحلفائها بأن جنوده بكامل قوتهم وأنهم لم ينهزموا ولكنها الحرب والمكيدة . 2- سيكثفوا العمليات الاستشهادية لوقف الزحف على الأنبار . 3- سيقوموا ببسط سيطراتهم على مدن أخرى كالموصل وغيرها لتشتيت القوات الأمريكية كما كانوا يفعلون في السابق . فكما تلاحظون فالقاعدة لم تفعل أيا من ذلك بل على العكس . حيث قامت بإخلاء الأنبار من المسلحين بشكل كامل حتى أن الرمادي لم تقم فيها أي عملية منذ أشهر ! فخطة الكرامة التي عادة ماتنشرها القاعدة كل أسبوعين وتضع فيها حصيلة العمليات التي قامت بها كانت آخر إحصائية هي أسوأ إحصائية مرت على العمليات المسلحة في العراق! فبعد أن نشرت في شهر حزيران الماضي أكثر من ألف عملية في أسبوعين لم تنشر سوى مائتي عملية في آب !! فما هو السبب في نشر مثل هذه الإحصائية المتواضعة ؟ !! لاسيما والقوات الأمريكية تشن حربا ضروسا لا هوادة فيها ! وهذا يخالف سياسة القاعدة الإعلامية . ومع كل هذه المعطيات أيقنت أن هناك لعبة تلعبها القاعدة وخدعة تعد لها ، ولقد كنت أنوي الكتابة عن هذا الأمر قبل وقوعه ولكني تراجعت في النهاية خوفا من إثارة البلبلة لاسيما وهي مجرد تخمينات لا دليل عليها ولكن ها هي التخمينات تصبح حقيقة . الهدف هو أن القاعدة والمسلحين في العراق توصلوا إلى قناعة تامة بأن القوات الأمريكية على وشك الرحيل حيث أن الحرب قد أرهقتها كثيرا ولا بد لها من الرضوخ للمطالب الشعبية بالانسحاب . وانسحاب القوات الأمريكية من العراق يعني أن السيطرة ستكون للمسلحين ولهذا فمن الخطر أن يسكن الإنسان بيتا لا يعرف أساساته ولا كيفية بنائه ولهذا أرادت القاعدة بهذه الخدعة أن تتعرف على ولاء العشائر العراقية وتكتشف صدقها في حماية المسلحين ودعم مشروعهم قبل انسحاب القوات الأمريكية من العراق . لأن الولاء أحيانا يكون بسبب الخوف من البطش ولهذا أظهروا الضعف لتظهر حقائق الجميع ويتعرفوا على من كان صادقا في الولاء ممن كان يتربص بهم سرا . وجعلوا شهر رمضان بداية لتصفية الحساب مع أعدائهم ! أما لماذا جعلوا شهر رمضان هو البداية . فهذا يعود لما لهذا الشهر من الأثر الكبير على معنويات المسلحين ارتفاعا وعلى معنويات القوات الأمريكية انخفاضا . وفعلا نجح المسلحون في تنفيذ خطتهم الماكرة واصطادوا زعيم صحوة الأنبار في أول أيام رمضان مما يعني أن الأمور ستكون مرعبة في الأيام القادمة . المصيبة ليست في مقتل زعيم المجلس ولكن فيما سيأتي بعدها فكما تحدثنا سابقا أن الاغتيال هو هدف واحد من أهداف الخطة وإلا فهناك المزيد . مما سيربك الوضع تماما في الأنبار وستتوالى الاغتيالات للمتصدرين لهذا المجلس وستكثر العمليات الانتحارية داخل الأنبار وخصوصا في مراكز الجيش والشرطة ، فأعضاء صحوة الأنبار أصبحت وجوههم مكشوفة وأعمالهم معلومة فهم أظهروا نياتهم أثناء انسحاب المسلحين ولم يعد أمرهم خافيا على أحد وهنا المشكلة ! ولذلك فلا غرابة عندما يضطر هؤلاء للخروج من الأنبار بأسرع وقت ممكن فهم لم يتجرؤوا على ذلك إلا بعد أن تيقنوا أن المسلحين قد انتهوا ولو كانوا يشكون ولو مجرد الشك أن المسلحين سيعودون للأنبار لما فعلوا ذلك ولما وثقوا بزعيم المجلس ولا بالقوات الأمريكية . ولهذا أتوقع أن تتدارك القوات الأمريكية الموقف بأسرع وقت وتضع الحلول لذلك . ولا أظن أن المواجهة مع المسلحين من قبل العشائر ستكون مفيدة فالعوامل كلها في صالح المسلحين ، فهم يتفائلون برمضان كثيرا ومعنوياتهم مرتفعة جدا وغالبا ما تشتكي القوات الأمريكية من ازدياد العمليات في هذا الوقت . دعونا ننتظر فالأيام حبلى بالمفاجآت . As-Sahab is not al Qaeda, it is the media arm of AQ. ( The world views as-sahab as if it were REAL, it is not. As-Sahab is doing a remarkable media job. But they are loosing their demographic. They are command and control, recently in command and control of zip, nada, nothing. And Muslims world wide are rejecting al Qaeda. Imans against AQ. Al qaeda doesn't have the cadre to pull off the operations as-Sahab calls for. were utter disasters with out trained cadre to teach the would be suicide bombers. Al Qaeda Suicide bombers 50% of the time only kill themselves. The timing of this release gives an indication of AQ's intent. By this time, their cells should have carried out at least three attacks, one each in Denmark, Germany, and Turkey, after Osama bin Laden's message from two weeks ago. The German cell had a deadline of September 15th, and one could presume that the others had similar instructions. This video was meant to be seen after three successful attacks across Europe and Asia, behind enemy lines for AQ. Miserable failures: AQ is almost Impotent outside Iraq. And inside Iraq it is a "virtual Group" iai that is under fire and on the run. In early 2007 Ramadi, the capital of Iraq’s Anbar Province, was one of the most violent war-torn cities on Earth. By late spring it was the safest major city in Iraq outside Kurdistan. Read the rest. Remember, this is the same city that al Qaeda in Iraq declared as its capital for the Islamic State of Iraq. So al Qaeda has turned to the Talaban in hope of some success and a lift in AQ moral. "Urgent, al-Qaida declares war on the tyrant Pervez Musharraf and his apostate army, in the words of Osama bin Laden," it read. But the Talaban has not yet figured out how they have been used by al Qaeda. al Qaeda suckered Talaban into a fight with the USA army and the Talaban lost Afghan and have been on the run ever since. Talaban has partnered with Satan. Gaddahn: The new al Qaeda leader? Perhaps one of the most successful achievements of the old guard al Qaeda, besides staying alive, is the vast expansion of its propaganda outreach arm. Not only are the videos and tapes coming fast and furious, but in multiple languages aiming at a wide variety of audiences. This indicates a level of sophistication and and stability that is both deeply alarming and indicative of how secure the group feels. The videos, with different scenes, subtitles, translations and rapid turnaround time (indicated by the references to recent events) shows that the old guard al Qaeda is dedicating significant resources to the propaganda/outreach wing and has a desire to retain a place of preeminence within the jihadi world. As AQ looses on the battle fields of the world they consolidate in the only arena left to them: the world wide web, the Internet. Al Qaeda hypothesis is flawed based in Islam. Their hypothis involves Muslim killing Muslim, women, children and bombing Mosques and market places. Those groups who reject them are murdered. And the Ummah is recognizing this and rejecting AQ all across Islam. al Qaeda is on its last leg as evidenced by lack of attacks and the flurry of desperate videos begging for suicide bombers. al Qaeda's reputation is catching up with them in the world of Islam and AQ is being rejected. Kevin Poulsen, beware. The National Security Agency is coming after you. Or at least your hacker descendants. Fresh from their utter and complete victory over Islamic terrorists, the Ft. Meade gang is turning its attention to a new set of foes, Siobhan Gorman reports for the Baltimore Sun. Fort Meade gang is going after as-sahab, recently they shut down all the terrorist sites until they could review the latest video release before anyone else could. Ft. Meade has penetrated as-Sahab and all major forums. According to our count they have taken out 5 jahidist web masters. AQ is failing on all fronts, they are impotent, and face their demise with a flurry of activity that signifies an desperate attempt to turn the Ummah's rejection of AQ. Islam will take out al Qaeda, it is under way, AQ is counting its days. USA winning, is way ahead of al Qaeda. as-sabah up loaded this video to 830 places on the web, so they must think its important, and shows how desperate they are. But it is a bad/tricky password to get it to work, peter principle. Doha • Noted Islamic scholar, Dr Yusuf Al Qaradawi, has called on Al Qaeda's North African wing to ‘repent’ the bombings they carried out in Algeria recently, review their ideology and shun violence, local Arabic media reported yesterday. “You should follow in the footsteps of the Islamic (extremist) group in Egypt which has announced that they are shunning violence,” the cleric urged Al Qaeda leadership in Islamic Maghrebi (North Africa). "Regret your actions and join the Islamic mainstream," he added. In a letter addressed to the Algerian President, Abdelaziz Bouteflika, Al Qaradawi said he was deeply saddened by the twin bomb attacks in Algeria ( in Dellys and Batna towns) which have claimed 60 innocent lives and left more than 200 injured. The cleric was in Algeria recently and fell ill. He was admitted to a military hospital and Bouteflika called on him. Al Qaradawi thanked him for the gesture. Another AQ video, "power of truth". The SITE Intelligence Group has learned that a new video is forthcoming from the multimedia arm of al-Qaeda, as-Sahab, titled, “The Power of Truth”. A montage of images on a mock-up of a monitor in the advertisement shows the faces of al-Qaeda leadership, including Usama bin Laden, Dr. Ayman al-Zawahiri, Mustafa Abu al-Yazid AKA Sheikh Saeed and Abu Musab Abdul Wadud. Other individuals shown as appearing in the forthcoming release include Mullah Mansour Dadullah, Muhammad Atta, Abdul Bari Atwan, the chief editor of Al-Quds Al-Arabi newspaper, Dr. Abdullah al-Nafeesi, and Michael Scheuer, former Chief of the Bin Laden Issue Station of the CIA. The circumstances of the Taleban's emergence remained the centre of controversial debate. Despite repeated denials, Pakistan is seen as the architect of the Taleban enterprise. Suspicions arose early on when the Taleban went to the rescue of a Pakistani convoy stranded in Kandahar following attacks and looting by rival mujahideen groups. Many of the Afghans who joined the Taleban were educated in madrassas (religious schools) in Pakistan. Pakistan was also one of only three countries, along with Saudi Arabia and the United Arab Emirates (UAE), which recognised the Taleban regime. It was also the last country to break diplomatic ties with the Taleban. The US put Pakistan under pressure to do so after the 11 September, 2001, attacks in New York and Washington. The Taleban were overwhelmingly Pashtun, the ethnic group that forms the majority of Afghanistan's diverse population and also inhabits the North-West Frontier Province (NWFP) and Balochistan in neighbouring Pakistan. Even now, the resurgent Taleban draw considerable sympathy from fellow Pashtuns in Pakistan. Some of their fugitive leaders are able to find refuge across the long and porous border in NWFP and Balochistan. Once in power, the Taleban set up an authoritarian administration that tolerated no opposition to their hardline policies. Islamic punishments, such as public executions of convicted murderers and amputations of those charged with thefts, were introduced. Television, music and cinema were banned after being adjudged as frivolities. Girls aged 10 and above were forbidden from going to school - working women were ordered to stay at home. Men were required to grow beards and women had to wear the burqa. The Taleban's religious police earned notoriety as they tried to implement these restrictions. 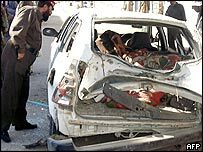 Taleban policies, particularly those concerning human and women's rights, also brought them into conflict with the international community. But what was to bring much greater conflict was the Taleban's role as host to Osama Bin Laden and his al-Qaeda movement. Defeat of the terrorists means good bye a Billion Dollars. And Patki won't go after al Qaeda, Talbi in some parts of Pakistan, and won't allow USA to go there either. Am I seeing a light? Remember the first article above? “The purpose of the operation is to continue to remove the Taleban from the area north of Gereshk, to set the conditions whereby the people who live there can start to enjoy security and the government ... can begin to apply governance and development,” Lt. Col. Richard Eaton said. BEIRUT, Lebanon (CNN) -- A member of the Lebanese parliament died in a Beirut bomb blast Wednesday -- the latest anti-Syrian politician to be killed in the country. Lawmaker Walid Eido, his son, Khalid, and two of his bodyguards were killed, Lebanese media reports said. Some are calling the attack an assassination and pointing the finger at Syria. At least six other people died and 11 were wounded in the explosion, believed to be from a car bomb, in the seaside neighborhood of Manara, according to Lebanese security sources. Druze leader Walid Jumblatt, an outspoken critic of Syria, blamed Eido's killing on Damascus, calling it an attempt to reduce the anti-Syrian majority in the Lebanese government. KABUL, Afghanistan (AP) -- Taliban fighters carrying machine guns and rocket-propelled grenades used children as human shields during a battle in southern Afghanistan on Wednesday, forcing U.S.-led coalition soldiers to hold their fire for a time, the coalition said. The clash in Uruzgan province began when more than 20 insurgents attacked a joint Afghan and coalition patrol, the coalition said in a statement. As aircraft prepared to bomb the site, "coalition forces as well as the aircraft identified several insurgents in one compound using children as human shields," the statement said. Ground troops and the aircraft withheld fire to avoid injuring the children, it said. The soldiers did fight the insurgents when they tried to flee the compound, and more than a dozen suspected militants were killed, the coalition said. "The truth is that the Sunnis launched this war four years ago, and have been defeated. The tribes never win wars, they only join the winners." This morning during a Pentagon teleconference, Army Major General Kevin Bergner trumpeted recent "successes" against insurgents and terrorists in Iraq, including last month's targeting of the man allegedly responsible for the massive August bombing that killed 400 members of the Yazidi sect. "Abu Yaqub al-Masri was killed when coalition forces conducted operations to detain him on 31 August west of Tarmiyah," Bergner said in a follow-up email. THEY ARE NOW ON THE THIRD OR FOURTH STRING PLAYERS, less and less experienced leaders. ......However, what happened in Anbar and the clashes in north Lebanon`s Nahr el-Bared Palestinian refugee camp, where the Lebanese army engaged in ferocious fighting over three months with members of an al-Qaida-backed militia called Fatah al-Islam, defeating them and killing their leader in the process, are major benchmarks in the ongoing war against terrorism. As in Iraq were the Sunnis demonstrated not only their ability to turn against al-Qaida, but to defeat them in battle, so too, has the Lebanese army shown that al-Qaida was far from invincible. In three months of severe clashes involving artillery duels, the Lebanese army suffered close to 200 casualties -- a huge number given the size of the Lebanese armed forces. But the determination of the Lebanese army showed that the answer to the infiltration of al-Qaida in Arab countries is to engage local forces in the battle, rather than foreign troops. The crushing defeat suffered by al-Qaida in Anbar and in north Lebanon is not to be underestimated. The terrorist organization will fight back in any way it can. They will conduct targeted assassinations of those who dared to oppose them, as they did in Iraq last week when they killed a prominent Sunni sheik who dared to defy them by publicly announcing his alliance to U.S. forces. Yet what we are seeing with the opposition to al-Qaida`s interference in domestic affairs by the Iraqis and the Lebanese is highly significant. This in fact marks the third major setback suffered by Osama bin Laden`s terrorist outfit in the Arab world. Their first defeat came in Saudi Arabia when Saudi forces, following an initial setback, were able to retake the upper hand, defeating, capturing or killing a number of cells operating in the desert kingdom. The second and third defeats came back-to-back with the victory of the Lebanese army over Fatah al-Islam and the routing of the Islamists from Anbar province. AQ most recent videos have been commercials for suicide bombers, and recruits. They are hurting. Islam turns against them. and they must use Rewards and hope operations happen, desperate situation. As The Croissant just reported citing 2 reports in the Algerian press, Abdelmalek Droudkel, aka Abu Mussab, was allegedly kicked out of his position of emir of Al Qaeda in the Islamic Maghreb (AQIM) by his peers. I had mentioned on this site the dissension inside the ranks of AQIM since the ex GSPC changed his name in January and pledged allegiance to Al Qaeda. In fact after the triple suicide bombings in Algiers on 4/11, many AQIM members did not approve of the use of suicide bombings targeting civilians. To go on a limb, this news could mean the death of AQIM per se and a return of the ex GSPC to a more guerilla style terrorism approach. Long article, but a good one, you can see light at end of tunnel, great perspective. Need to seperate taliban from al Qaeda. Social change. when local institutions tend to favour the strong over the weak. quiet, and has consequently been left to its own devices. six. He wept as he told his story. said , tears pouring down his cheeks. for your propaganda against the commanders,” he said. “I went everywhere. I wanted justice. I wanted to avenge the murder. Qul himself, he had 5,000 men under arms at the time. were set initially have not been achieved. Takhar’s provincial governor Latif Ibrahimi agreed. Victims say that the government is unwilling or unable to help them. grievances often have little recourse. charges are brought, the courts decide in favour of the commanders. commanders were a law unto themselves. appointment of a mayor was opposed by a local commander. stomach as he told his tale of violence and intimidation. for asking for my rights. is a resident of Takhar’s capital, Taloqan. months after we got engaged, a commander took my fiancée by force. has encouraged them to try to regain their lost power,” he said. government, which they can use to their advantage, he said. Taleban, and that these commanders are not a threat,” he said. Sayed Yaqub Ibrahimi is an IWPR staff reporter based in Mazar-e-Sharif. punishment, but many residents say they prefer it that way. and taken him to their base in Miaan Kushti. Taleban, who form the de facto local administration. almost totally ceded to the Taleban. professed himself happy with the Taleban courts. The mullah railed against the laxity of Afghanistan’s civil law. very happy with the Taleban court system. Taleban don’t waste time,” he said. with district governors, police, courts and judges. takes time to study a case,” he insisted. the government was at times strained. part because there is bribery in the government courts,” he said. feelings about having a Taleban administration in charge. here that foreigners are killing Afghan civilians,” he said. grievance against the Taleban courts. “I fell in love with my brother-in-law’s sister,” he explained. “One day I was at her house to see her, and her brothers caught me. Aziz Ahmad Tassal is an IWPR staff reporter in Helmand. industrious farmers are turning to another cash crop - marijuana. northern province of Balkh had stopped growing opium poppy. increased at a precipitous rate. Other crops would not meet his family’s expenses, insisted Nazar Gul. ahead of any legal crop. “For us farmers, poppy is gold and marijuana is silver,” he said. alternative crop is on the rise in Balkh. taken its place,” he said. government had few tools with which to combat the new problem. marijuana in the province, but who is going to pay for it?" he asked. a commission that worked with farmers to stop growing that crop. foreign military vehicles use all the time. While the government dithers, farmers are making a killing. The price of hashish differs according to type and quality. normally earned 100 dollars a kilo, sometimes 200 dollars. was easier to smuggle the processed hashish. send it to the south to sell to major traffickers,” he said. institution whose ancient shops mostly sell the local speciality. The buyers are mostly young men with a little spare cash, he added. for a pound of hashish. anybody who smokes it just fall down,” he said with pride. stand on hashish as it did on opium. The governor, still citing cash problems, was not so sure. harvest, and are keeping one uneasy eye on law-enforcement officers.